In a remarkable display of compassion and solidarity with the city of St. Petersburg which suffered a terrible terrorist attack on April 3, Dresden authorities have decided to light up the city’s Palace of Culture in the colors of Russian national flag. On Monday, an explosion occurred in the St. Petersburg underground on the stretch of rail between the Sennaya Ploshchad and Tekhnologichesky Institut metro stations at around 3 p.m. local time (12:00 GMT). The blast killed at least 14 and left 49 people injured. 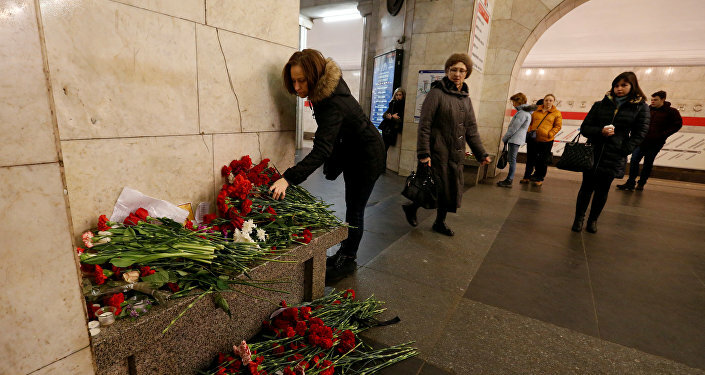 In a letter penned to St. Petersburg Governor Georgy Poltavchenko, the head of the Dresden city administration Dirk Hilbert offered his condolences and condemned the terrorist attack as a 'cowardly act,' according to Sputnik Deutschland. "On behalf of all people of Dresden I offer you our sincere condolences. In this dire hour our thoughts go to the friends and families of those who died, and we wish a speedy recovery to those who were injured," Hilbert wrote. He also added that tonight on April 4, from 8 pm until 12 pm local time, Dresden’s Palace of Culture will be lit up in the colors of the Russian national flag as a sign of mourning and condolences. His words were echoed by Sue Murphy, Deputy Leader of Manchester City Council who also condemned the terrorist attack "against people going about their daily businesses." "Terrorists will never be able to defeat or divide us," Murphy wrote in a letter to the St. Petersburg administration. She also launched an online Book of Condolences on the city council’s official website so that the city residents could express their sympathy to "the families and friends of those killed in the attack." It should be noted that both Dresden and Manchester are both sister cities of St. Petersburg. Also, the Paris city administration decided to switch off the lights at the iconic Eiffel Tower on midnight to show honor the memory of the people killed in St. Petersburg attack. "This evening, at midnight, Paris will turn off the lights at the Eiffel Tower in memory of the victims of the attack in St. Petersburg," Paris Mayor Anne Hidalgo wrote on her Twitter, adding a hashtag "We stand united."